WataugaWatch: Is Nathan Miller Legally Serving on the County Commission? Well, if its a problem, he can rent a room in the district and stay there once a year while claiming residency. if Hilary can do that to be a senator, then it must be legal. If htte room was in a dorm for ASU, then certainly there would be no problem. Maybe they can just draw a circle around his house and move it into District 5. You know, JW...The same way they went 2 miles outside of Boone town limits to draw a circle around YOUR house and make Pam eligible for the various town boards. So according to Eggers, if he currently lived in TN or Ashe county, that would be okay, because it only matters where he lived when elected? I have not opined recently on either the Watch or the Conservative. However, this is a question, I have been asked by a lot of people, mostly those living in District 5, the district Nathan Miller did reside in. Nathan began to tell people he had moved which resulted in people asking the question and rightfully so. I decided to investigate. This is what I concluded after my investigation. There are 2 questions to be answered when a county commissioner moves out of his district. The “second” provision is the issue in question. Is Nathan Miller eligible to vote, if there were an election held while he resides at his new location, in an election for the office which he holds currently? The answer to that question is, “yes”. According to Watauga County Ordinance VIII, the county is divided into 5 districts and candidates from each district are allowed to run for a seat representing that district on the Board of Commissioners. And, the all qualified voters of the county (regardless of the district they live in) are qualified to vote for the candidates running in all five districts. 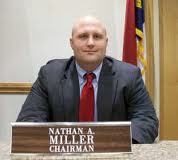 Nathan Miller still lives in the county so he is not disqualified according to the NC State Constitution. At the first election in 1976 all members of the board shall be elected. A simple majority (3) of those elected shall be elected for two-year terms, and the remaining members shall be elected for four-year terms. The candidates receiving the highest number of votes shall be elected for four-year terms. At each subsequent general election, a simple majority of the board shall be elected with the candidate who is elected with the least number of votes serving a two-year term and the other members elected serving four-year terms. The resolution was passed on January 10, 1975, according to the minutes of the Watauga County Commissioners. A voter referendum was held on March 22, 1975 (I was getting a degree in Mathematics instead of law at the University of South Florida). According to the “Abstract of Votes”: ”We, the undersigned, the County Board of Elections for said County, having opened, canvassed and judicially determined the original returns of the Special Election in several precincts in this County, held as above stated, do hereby certify that the above is a true abstract thereof and contains the number of legal ballots cast in each precinct FOR and AGAINST the Proposition to Alter the Structure of the Board of County Commissioners, as returned to the County Board by the Registrars. Given under our hands, this 24th day of March, 1975. According to JW’s post above, Stacy Eggers IV told the Board of Elections, “that the language of the statue applies only to the moment that the commissioner is elected”. As discussed, this is a question for the County Attorney, Stacy Egger IV and not Board of Elections member Stacy Eggers IV. Not being at the meeting, I don’t know which hat he was wearing. With regard to the local ordinance above, it is clear to me that there is a distinct difference in candidate (running for membership on the Board of Commissioners) and member (elected, residing in and representing the district, and serving a term on the Board of Commissioners). The local ordinance (statute?) spells out not only what happens at the moment one is elected; it lays out the structure of the Board of Commissioners. According to the ordinance, the structure requires 5 districts with “members residing in and representing the districts as set forth in the apportionment plan above”. Ludicrous to say that this statute only applies at the “moment one is elected” because one is a member from the time elected until he no longer qualifies under the ordinance. Do two-year and four-year terms only apply at the “moment one is elected”? Is he saying that someone could live in District 1 up until the date he/she is elected and then move to District 2 one moment after elected? Ludicrous. And, this is not a political question, this is a legal question. The answer will not only affect Republican Nathan Miller’s membership designation, it will affect all current and future members (Republican, Democrat, Unaffiliated, et al) who might move out of their district while serving their term. The local ordinance establishes "residency districts". I am not a lawyer. I am an activist for good government, government by the people and for the people. I would like to pose another question: Now that the board of elections is considering the question of Nathan Miller's qualifications, can Stacy Eggers, IV who is a board of elections member, now opine on the question as county attorney. Or, will the County have to get another attorney to opine? So, Debora. When Miller does finish his term, will you run as a Democrat? A Republican? Or an Independent? I doubt that I will run because if I ran for commissioner I would have to run affiliated. I would have to then run Republican. And, I would never get the blessing of the local GOP. I make a better activist. What is the legal definition of residence? The first two posts have a point. If Miller has a house under construction that he is going to live in, does that qualify as his residence. It would seem to be more ties to the district than a dorm room but students are residents. I know people that lived in their basement for three years before the entire house was finished. At what point can he claim it as a residence, whether he actually lives there or not? I see little difference in this and the Boone attorney being part of the decision making process and then advising the Council and BOA how to conduct business. The Board of Elections would have a say if Miller was running for reelection and didn't live in his district. They don't have authority to remove people from office. Funny how none of this came up when it was Democrats that were living outside their districts! First, any person who shall deny the being of Almighty God." You made the front page of the Democrat J.W. Guess you hit a nerve or something.